Old Faithful is Yellowstone National Park's most famous landmark. Millions of visitors come to the park every year to see the geyser erupt every 44-125 minutes. But despite Old Faithful's fame, relatively little was known about the geologic anatomy of the structure and the fluid pathways that fuel the geyser below the surface. Until now. University of Utah scientists have mapped the near-surface geology around Old Faithful, revealing the reservoir of heated water that feeds the geyser's surface vent and how the ground shaking behaves in between eruptions. The map was made possible by a dense network of portable seismographs and by new seismic analysis techniques. The results are published in Geophysical Research Letters. Doctoral student Sin-Mei Wu is the first author. For Robert Smith, a long-time Yellowstone researcher and distinguished research professor of geology and geophysics, the study is the culmination of more than a decade of planning and comes as he celebrates his 60th year working in America's first national park. "Here's the iconic geyser of Yellowstone," Smith says. "It's known around the world, but the complete geologic plumbing of Yellowstone's Upper Geyser Basin has not been mapped nor have we studied how the timing of eruptions is related to precursor ground tremors before eruptions." Old Faithful is an iconic example of a hydrothermal feature, and particularly of the features in Yellowstone National Park, which is underlain by two active magma reservoirs at depths of 5 to 40 km depth that provide heat to the overlying near-surface groundwater. In some places within Yellowstone, the hot water manifests itself in pools and springs. In others, it takes the form of explosive geysers. Dozens of structures surround Old Faithful, including hotels, a gift shop and a visitor's center. Some of these buildings, the Park Service has found, are built over thermal features that result in excessive heat beneath the built environment. As part of their plan to manage the Old Faithful area, the Park Service asked University of Utah scientists to conduct a geologic survey of the area around the geyser. For years, study co-authors Jamie Farrell and Fan-Chi Lin, along with Smith, have worked to characterize the magma reservoirs deep beneath Yellowstone. Although geologists can use seismic data from large earthquakes to see features deep in the earth, the shallow subsurface geology of the park has remained a mystery, because mapping it out would require capturing everyday miniature ground movement and seismic energy on a much smaller scale. "We try to use continuous ground shaking produced by humans, cars, wind, water and Yellowstone's hydrothermal boilings and convert it into our signal," Lin says. "We can extract a useful signal from the ambient background ground vibration." 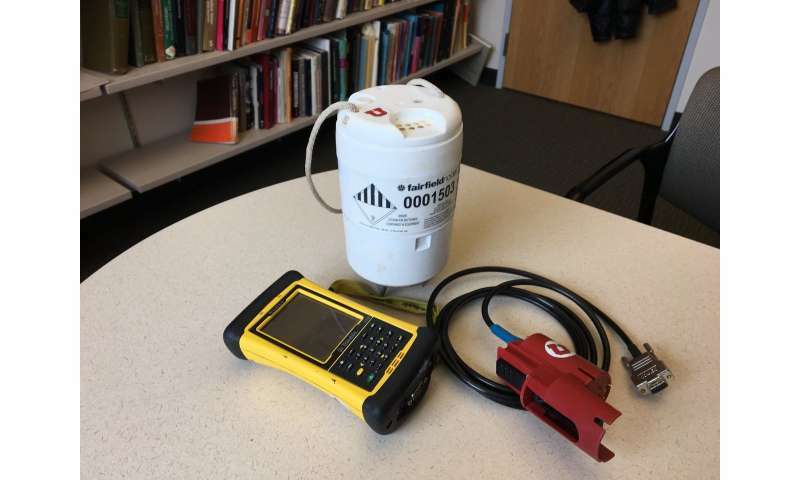 To date, the University of Utah has placed 30 permanent seismometers around the park to record ground shaking and monitor for earthquakes and volcanic events. The cost of these seismometers, however, can easily exceed $10,000. Small seismometers, developed by Fairfield Nodal for the oil and gas industry, reduce the cost to less than $2,000 per unit. They're small white canisters about six inches high and are totally autonomous and self-contained. "You just take it out and stick it in the ground," Smith says. In 2015, with the new instruments, the Utah team deployed 133 seismometers in the Old Faithful and Geyser Hill areas for a two-week campaign. The sensors picked up bursts of intense seismic tremors around Old Faithful, about 60 minutes long, separated by about 30 minutes of quiet. When Farrell presents these patterns, he often asks audiences at what point they think the eruption of Old Faithful takes place. Surprisingly, it's not at the peak of shaking. It's at the end, just before everything goes quiet again. After an eruption, the geyser's reservoir fills again with hot water, Farrell explains. "As that cavity fills up, you have a lot of hot pressurized bubbles," he says. "When they come up, they cool off really rapidly and they collapse and implode." The energy released by those implosions causes the tremors leading up to an eruption. Typically, researchers create a seismic signal by swinging a hammer onto a metal plate on the ground. Lin and Wu developed the computational tools that would help find useful signals among the seismic noise without disturbing the sensitive environment in the Upper Geyser Basin. Wu says she was able to use the hydrothermal features themselves as a seismic source, to study how seismic energy propagates by correlating signals recorded at the sensor close to a persistent source to other sensors. "It's amazing that you can use the hydrothermal source to observe the structure here," she says. When analyzing data from the seismic sensors, the researchers noticed that tremor signals from Old Faithful were not reaching the western boardwalk. Seismic waves extracted from another hydrothermal feature in the north slowed down and scattered significantly in nearly the same area suggesting somewhere west of Old Faithful was an underground feature that affects the seismic waves in an anomalous way. 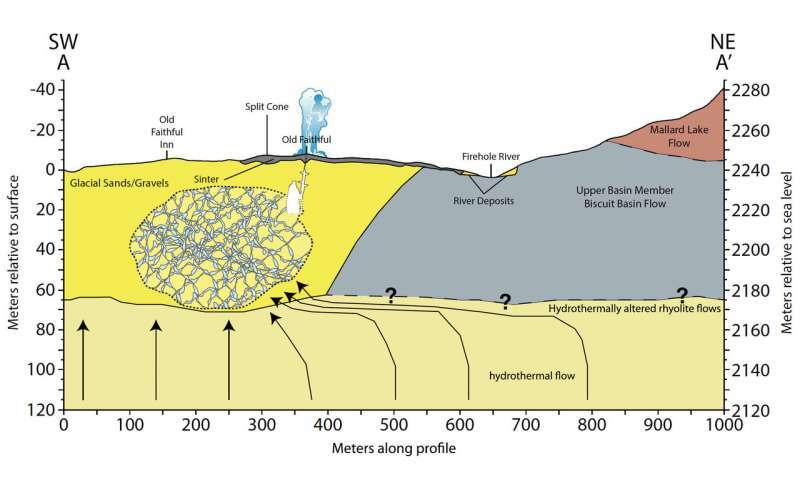 With a dense network of seismometers, the team could determine the shape, size, and location of the feature, which they believe is Old Faithful's hydrothermal reservoir. Wu estimates that the reservoir, a network of cracks and fractures through which water flows, has a diameter of around 200 meters, a little larger than the University of Utah's Rice-Eccles Stadium, and can hold approximately 300,000 cubic meters of water, or more than 79 million gallons. By comparison, each eruption of Old Faithful releases around 30 m3 of water, or nearly 8,000 gallons. "Although it's a rough estimation, we were surprised that it was so large," Wu says. The team is far from done answering questions about Yellowstone. They returned for another seismic survey in November 2016 and are planning their 2017 deployment, to begin after the park roads close for the winter. Wu is looking at how air temperature might change the subsurface structure and affect the propagation of seismic waves. Farrell is using the team's seismic data to predict how earthquake waves might reverberate through the region. Smith is looking forward to conducting similar analysis in Norris Geyser Basin, the hottest geothermal area of the park. Lin says that the University of Utah's research program in Yellowstone owes much to Smith's decades-long relationship with the park, enabling new discoveries. "You need new techniques," Lin says, "but also those long-term relationships." Well BN, I lack a knowledge of cameras built to survive such an extreme environment as a geyser. But, how would the gathered photos or CCD signal ever be retrieved? Is there a cable made to work in a geyser? And, that isn't an old-fashioned, open well into geyser. Not a pipe but a sponge would be a more correct simile. How would a camera, inserted into a boiling mud-pit, even take pictures? What sort of useful data would you be expecting? And would the Forestry Service be willing to contaminate a geyser with whatever exotic materials that made up such a camera? For example devices dropped to the surface of Venus, had a useful lifespan measured in minutes! Since the main problems of cameras or video filming of such an area is not a melting point of metals type hot, but only 'boiling water' hot there should be a wide array of equipment that can withstand that kind of thermals. I would think lighting to be the main problem, and even then mostly what one will see is rock tunnel smoothed from steam action over a Long Time, without much feature to it until one gets down to the cracked structures. We have the materials usuable for this, a simple steel cable, aircraft grade 1/8th inch would hold a couple hundred pounds, easy, so holding a 10 lb probe consisting of cameras and LED lights with battery pack in an insulated armored pod, possibly made from the transparent aluminum. If need be, a 1/4 in armored wire set may be used if electrical signals are wanted from the pod (for power and/or real time viewing), either in conjunction with or instead of the 1/8th in cable. But the whole thing can be smaller than a modern phone.